The ForTwo and ForFour share the same front-end and interior. The ForFour (left) is 800mm longer than the ForTwo. Daimler hopes to make its Smart small-car unit sustainably profitable by offering the same car in two sizes: the two-seat ForTwo and the four-seat ForFour. Daimler partnered with Renault to develop the cars, which share their platform with the Renault Twingo. All three vehicles have the same interior and powertrains. They also have a rear-engine, rear-wheel-drive layout. Are the new Smarts roomy? The third-generation ForTwo keeps its 2690mm length but is 100mm wider than its predecessor to offer occupants more elbowroom. How is the new ForFour different from the first generation? The first ForFour was developed with Mitsubishi and built alongside the Colt in the Netherlands. That ForFour had a front- engine, front-drive layout. The ForFour will not be sold in North America as it is considered too small for a four-seater there. The ForTwo is sold globally. 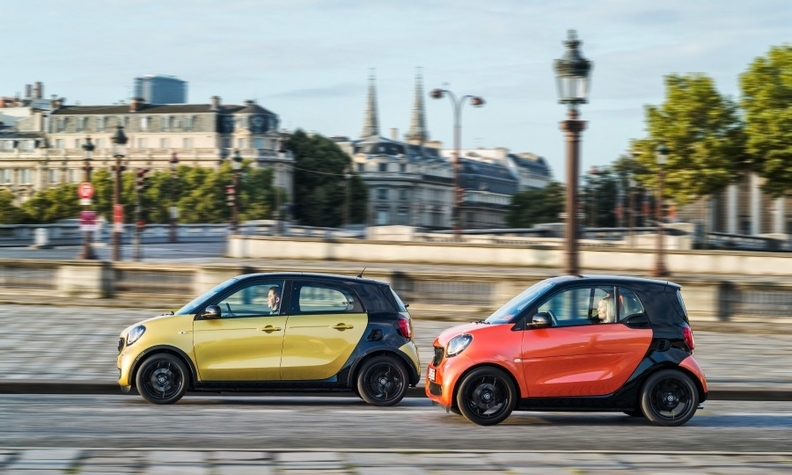 Daimler expects the ForFour to account for one-third of Smart's sales. Two three-cylinder gasoline units built by Renault: a 61-hp normally aspirated 1.0-liter engine and a 90-hp turbocharged 900cc unit. Diesel versions accounted for 8 percent of European sales of the previous-generation ForTwo. Developing a new diesel that meets Euro 6 emissions rules would add too much cost to the customer. To recover this extra cost, a Smart owner would have to drive about 17,500km annually for eight years. On average, Smart owners drive about 8,000km a year. Despite sharing the same underpinnings, 95 percent of the Smart and Twingo parts visible to the customer are different. Daimler CEO Dieter Zetsche does not expect the Twingo to steal sales from the ForFour, or vice versa. “The ForFour and Twingo have a strong identity and brand integrity,” he said. Zetsche added that there are stronger similarities between other shared offerings in the minicar segment, referring to the Citroen C1, Peugeot 108 and Toyota Aygo, which are built together in the Czech Republic. Smart brand head Annette Winkler said that sharing investments with Renault means that Daimler can offer better value for money, which “is crucial in the minicar segment.” Renault builds the ForFour alongside the Twingo in Slovenia. The ForTwo is made in France.